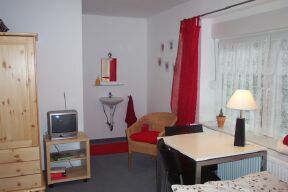 Nice room for one or two persons with shared kittchenette, where you can prepare breakfast an you own meal. Breakfast is not included and we don´t offer breakfast. We have tea and coffee, which you can make byyourself . Rooms have SAT-TV and we offer W-Lan acces. 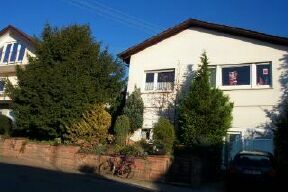 Our house is located on the vinejards very quiet an also central. You can take a walk through the lovely vinyards and also reach Heidelberg by tram in about 10 Min.. Heidelberg is very famous about the old Heidelberg castle and a lot more things of interesst. Our rooms are double rooms for 1 or 2 persons, if you are 3 people, you can book a double room and we can offer you a roll away bed for 10, 00 Euros a night. Payment in cash at the check in day. For No-Show cases and cancellations in less than 48 hours before the check in time the first night will be charged. Tram and bus terminal are about 10 minutes from our house by foot. Tram departes to Heidelberg every 10-20 minutes.